That’s right, four years. Every year since 2014 the Oregon Mt. 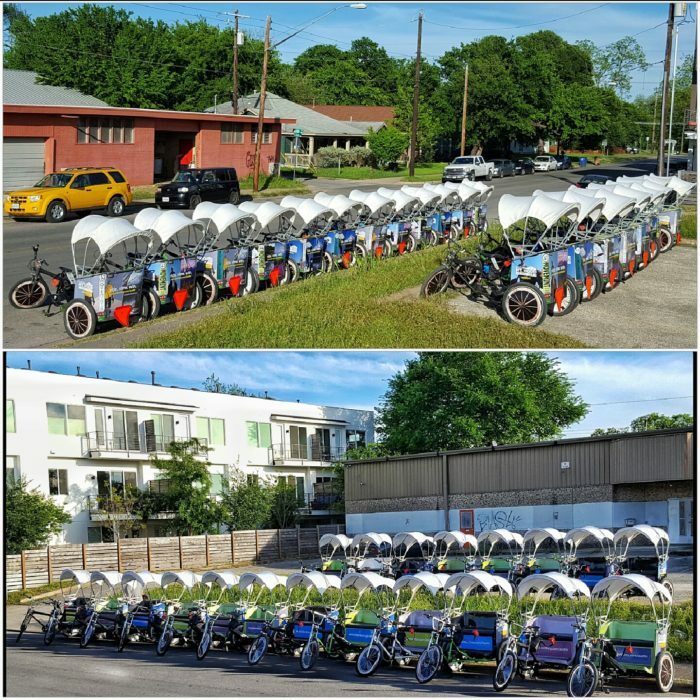 Hood Territory has elected to run a 3-month, post-SXSW campaign, and we appreciate their confidence in pedicabs as an advertising medium. (They have literally won awards for their unique and successful advertising.) 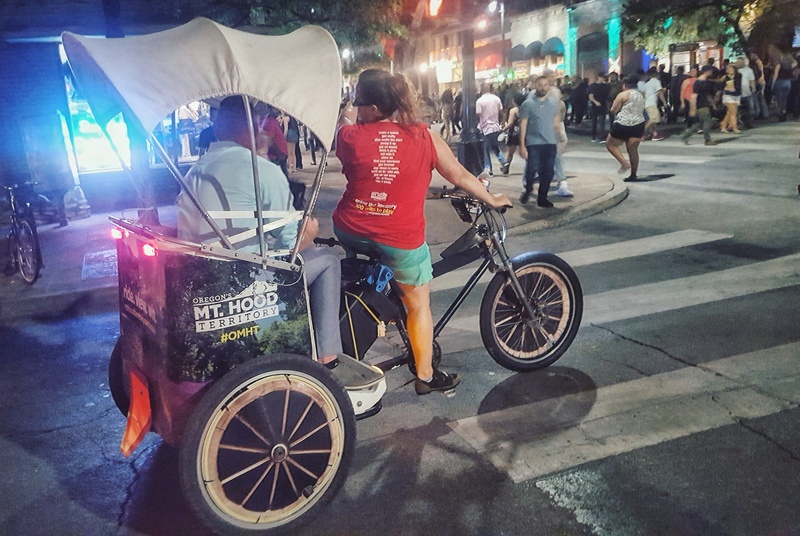 It’s kind of humbling to think that we have, for a solid year, had their snazzy wraps wrapped around our pedicabs, and that they were the first advertiser to push us to custom-make canopies — theirs being styled after Conestoga wagons, of course. Thanks for the push. They consistently wrap 20 pedicabs, including 60 “wagon” wheel covers. We reuse the canopies they ordered years ago. We always drape these fun ViewFinders from behind our pedicab drivers on a set of handlebars within reach of fares. Differently this year, however, they provided all-new wrap artwork as well as new driver jerseys because they wanted to better promote a contest they’d organized: “A free vacation to the Mt. Hood Territory, for two.” The onus was on the pedicab driver to distribute little colorful, informative pocket-sized flyers, and to tell the potential entrants their name because there was a secondary performance-based competition to see which pedicab driver was referenced most often in the online form needed to participate in the contest. Something also different this year was the level of experimentation in promoting their campaign with our social media outlets. (Some examples: Instagram, Twitter and Facebook.) Their reaction was positive, and we appreciated their advice with improving our messaging.